The Royal Ploughing Ceremony is an ancient fertility rite annually held in many Asian countries, including Thailand. The ceremony officially marks the beginning of the rice growing season. The Royal Ploughing Ceremony (Raek Na Khwan) is of Hindu origin. Earlier, Thailand also observed another fertility ceremony, which was of Buddhist origin. In the mid-19th century, King Mongkut (Rama IV) merged both ceremonies into a single one. Nowadays, the Royal Ploughing Ceremony consists of two parts. 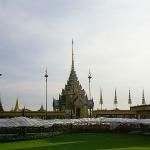 The Buddhist part is held in the Grand Palace at the heart of Bangkok. It is followed by the Hindu part conducted at Sanam Luang, a square in front of the palace. In 1957, the Royal Ploughing Ceremony was declared as a public holiday. It is typically presided over by the reigning monarch, but in recent yeses it has been overseen by Crown Prince Maha Vajiralongkorn. During the ceremony, the appointed Lord of the Harvest performs several rituals, one of which is the symbolic ploughing of the ground, accompanied by sacred oxen. Nowadays, it is more than just a religious ceremony. Farming is essential for Thailand's economy, and the ceremony focuses on honoring the bond between the King, the government, and the farmers who sustain the country.